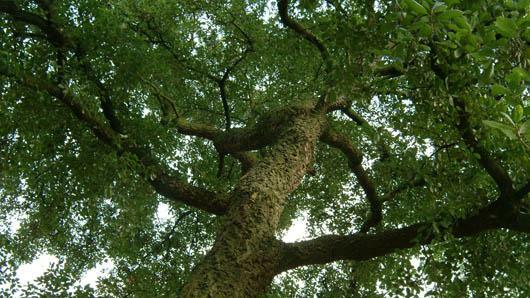 Quercus suber is slow-growing and long-lived, some individuals surviving to 250 years of age. 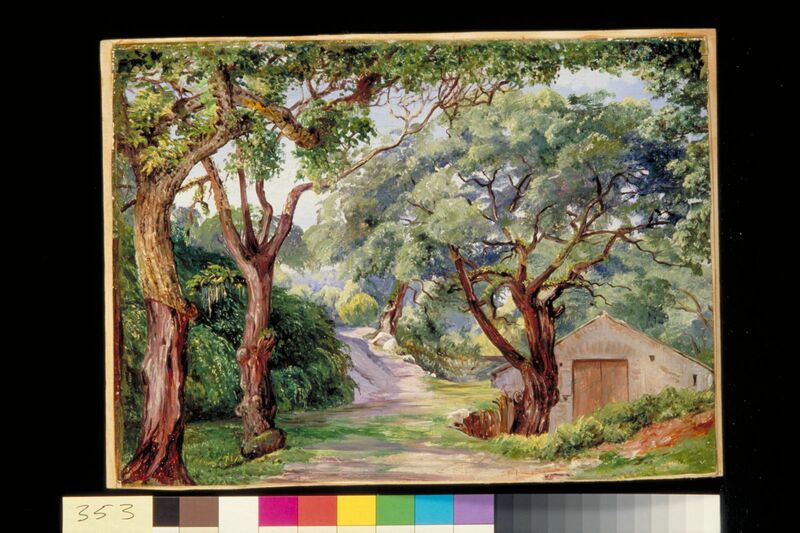 Cork oak landscapes are mosaics of forest habitats, comprising cork, holm and deciduous oak species, stone and maritime pines, wild olive trees, maquis (a type of Mediterranean shrubland), and pasture. 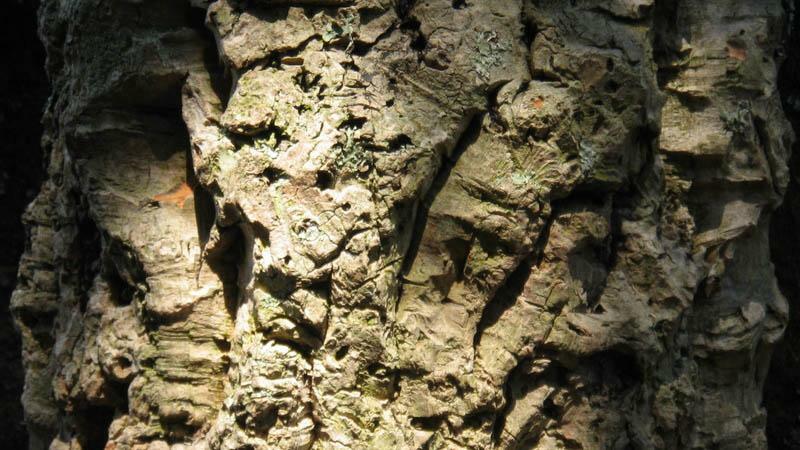 Cork oak bark has been harvested for thousands of years, and with good reason. The Romans discovered that it would float and used it for buoys in fishing nets, as well as for making sandals. Today it is most commonly known for its use in wine bottle corks. 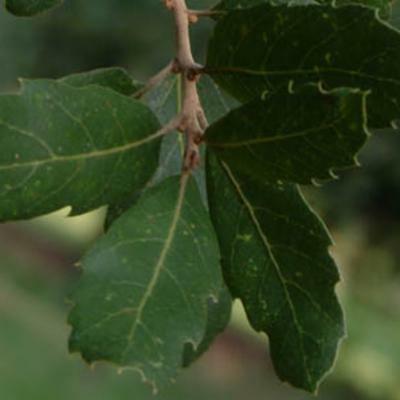 Quercus suber is limited to the Mediterranean Basin, and occurs in the coastal regions of southwest Europe and northwest Africa, including Algeria, France, Italy, Morocco, Portugal, Spain, Tunisia and the islands of Corsica, Sardinia and Sicily. 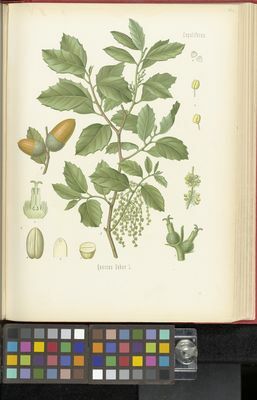 Some authors have suggested that Quercus suber may have originated in the Iberian Peninsula, where the species is mainly found today. 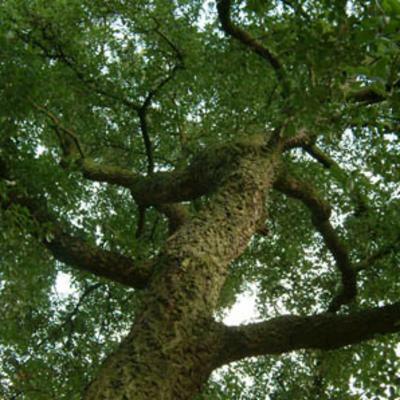 Cork oak grows best in areas with cold, moist winters and hot summers. It is commonly found at 300-600 m, but can occur up to 1,000 m above sea level. Cork oak is an evergreen tree with low, twisted branches and downy twigs. It can grow up to 20 m high, but is often shorter. It has very thick and deeply ridged bark, which is harvested as cork. The green leaves are 4-7 cm long, with spiny-ended lobes. and their margins are often curved downwards. The leaves fall during the second year of growth. Once a year, the tree produces fruits, known as acorns. The acorns are 2-3 cm long, and sit in a deep cup fringed with elongated scales. Cork oak is wind pollinated and monoecious (having separate male and female flowers on the same plant). Cork oak is easily distinguishable from the UK's most common oak, the English oak ( Quercus robur ), and not only by its knobbly grey bark. The evergreen leaves are long with spiny ends to their lobes, and bear little resemblance to the familiar curved shape of English oak leaves. It is also a much shorter tree and usually has low, twisted branches. The habitats that support cork oak are under ever-increasing threat, mainly due to human activity such as the intensification of agriculture and careless causes of forest fires (too frequent fires can damage the trees, as it makes them susceptible to fungal infection). Quercus suber forests are protected by the European Union (Habitats Directive 92/43/EEC). Cork oaks cannot be legally cut down in Portugal, except for the purpose of forest management (felling of old unproductive trees). The Natura 2000 network, a pan-European network of classified nature conservation areas, classifies montados (habitat 6310) and cork oak forests (habitat 9330) as very important for the conservation of biodiversity. 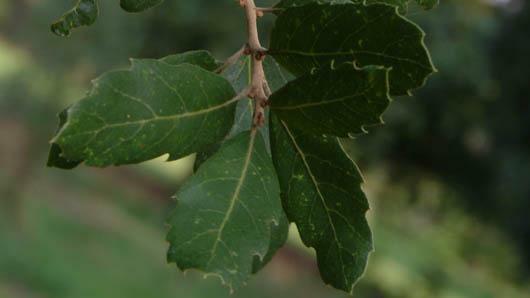 Leaves of Quercus suber The increasing use of plastic wine stoppers and metal screw tops could reduce the value of cork oak forests, leading to their conversion or abandonment. WWF has been working to publicise the environmental and economic value of cork stoppers, in particular with the wine industry, to show what would be lost if cork forests disappeared, and has a major programme to promote products derived from sustainably managed cork oak forests. 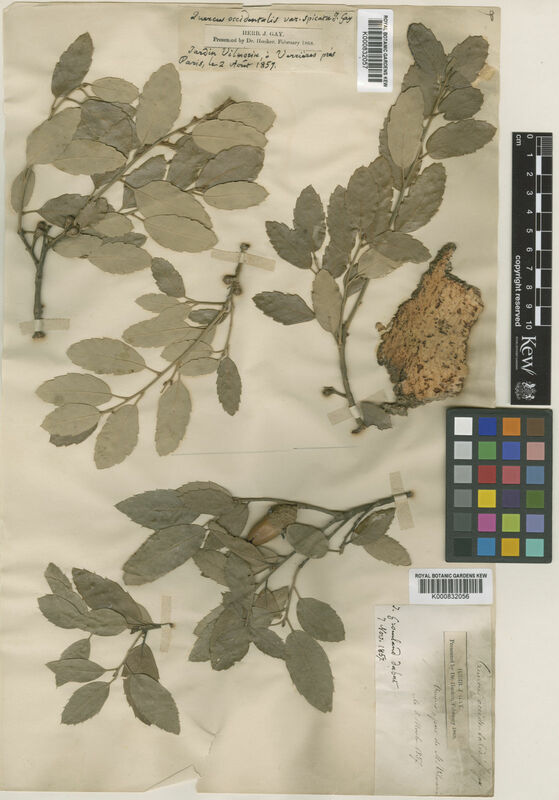 Quercus suber is a target species for the gene conservation network of the European Forest Genetic Resources Programme, which is co-ordinated by Bioversity International in conjunction with the FAO (Food and Agriculture Organization of the United Nations). This is a collaborative programme between European countries, which aims to ensure the effective conservation of genetic resources in Europe. Acorns are extremely attractive as a food source for many animals, resulting in a large proportion of the seeds being eaten, especially if the oaks are far from stands of other species bearing attractive forage seeds. The main uses of cork are in the production of wine bottle stoppers and insulation material. Other products made from cork oak include floats, insoles for shoes, gaskets, washers, fishing rod grips and notice boards. From medieval times cork has been used to insulate buildings, keeping heat in during the winter and keeping it out during the summer. 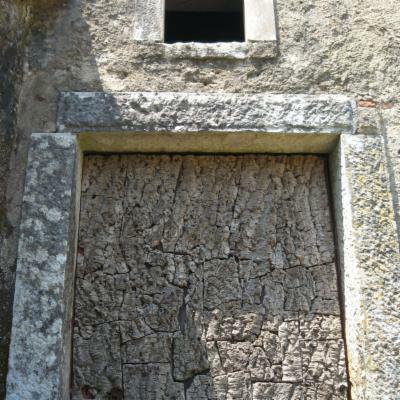 Monasteries were sometimes built with cork oak to protect them from the heat of the summer sun. Cork can be harvested from a tree 12 times within its lifetime. 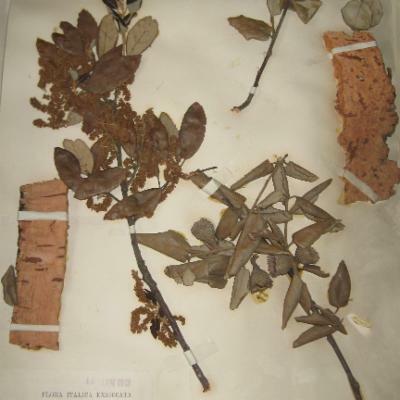 It is obtained by peeling the bark away from the trunk, leaving a thin layer of new cork still covering the functional part (secondary phloem) of the trunk. The first harvest (virgin cork) is made when the tree is approximately 25 years old. 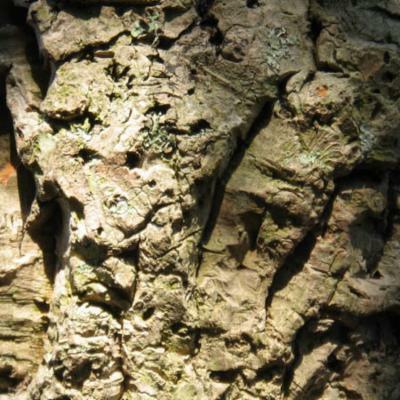 From that point onwards the bark can be harvested every 9-12 years, since the tree has the ability to reproduce a new layer of cork once the bark is removed. Cork harvesting is done entirely by hand. The harvesting of cork does not harm the tree and a new layer of cork re-grows, making it a renewable resource. The first two harvests produce poorer quality cork. Quercus suber is cultivated commercially for its cork in France, Spain, Portugal, Italy, Morocco, Tunisia and Algeria. 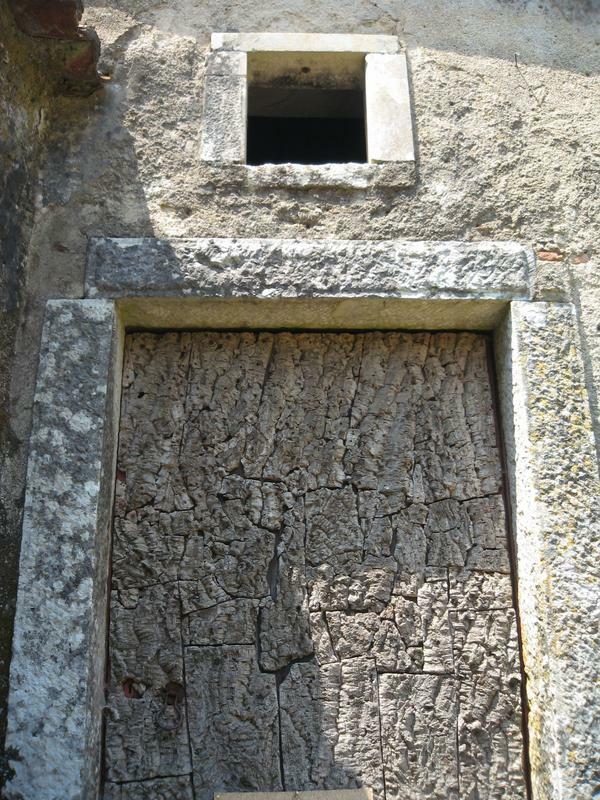 Portugal is the most important producer and the leading exporter of cork (providing about 50% of the world's cork supply). The cork industry is generally regarded as environmentally friendly. The production process is sustainable and both cork products and by-products can be easily recycled. Cork oak forests can also prevent desertification, and are the home of various endangered species (for example the Iberian lynx and imperial eagle). Cork oak forest has additional economic value providing cropping, grazing, hunting, honey, mushrooms and livestock farming, which are of considerable social importance as they are associated with traditional agrosilvopastoral practices. As fodder, acorns are low in protein and rich in carbohydrates, which are easily transformed into fat. Acorns are therefore used for fattening fully-grown livestock. Cork oak is also planted as an ornamental tree in parks and large gardens. As with other oaks, the seed of Quercus suber should be collected in the autumn when green. The viability of acorns can decline very quickly. At Kew, Q. suber acorns are sown in air pots, in an open, gritty mix, and kept in a cool glasshouse in natural light. Some are also sown directly into the Arboretum Nursery field (one of the behind-the-scenes areas at Kew), where they are protected from mice and squirrels. In the glasshouse, seeds germinate after around 6-8 weeks, whilst those in the field do not germinate until the following spring. By sowing seed in two different places, the nursery staff can compare results to determine the merits of each method. Sowing seed outdoors also helps them assess the hardiness of the species, which is native to the Mediterranean. The germination success rate is generally higher in the cool glasshouse than outdoors. Over-watering can rot the seed before germination is completed, so the watering regime has to be carefully monitored. Several approaches are taken for growing the young seedlings, with some being potted on into larger pots and others being planted into the Arboretum Nursery field in late spring. After about three years, the seedlings are large enough to be planted into the garden collection. For about the first ten years, the young plants are protected by netting, whilst they establish. Cork oak can be seen growing at Kew in the Mediterranean Garden. 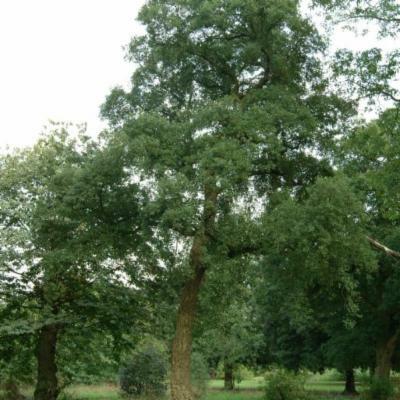 Quercus suber is one of the parents of the Lucombe oak, Quercus x hispanica 'Lucombeana' - the other parent being Quercus cerris (Turkey oak). 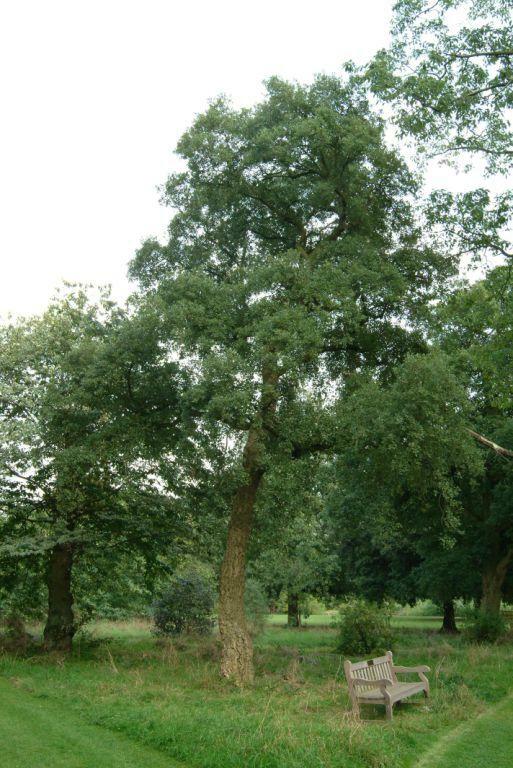 The Lucombe oak is one of Kew's 'Heritage Trees', planted around 1773, and can be found along Syon Vista. In Britain, Quercus suber is not grown commercially, and is planted only for its ornamental value. As an evergreen, it provides a year-round display of leaves which our native oaks do not, and is therefore something of a novelty. 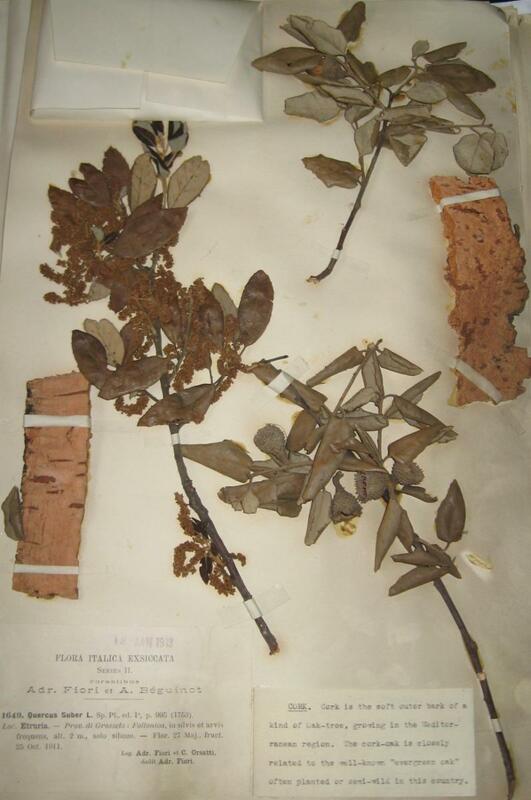 Kew's Economic Botany Collection, one of the behind-the-scenes areas of Kew, has over 60 samples of cork oak, including artefacts such as cork stoppers, as well as spoons and walking sticks made from the wood of the tree. Open woodlands, on hills and their lower slopes, generally on acidic soils. This species does not currently have an IUCN rating. Production of wine bottle stoppers and insulation material. Vogiatzakis, I. N., Griffiths, G. H. & Bacchetta, G. (2005). Human impacts on Quercus suber habitats in Sardinia: Past and present. Bot. Chron. 18(1): 293–300. Vogiatzakis, I. N. & Careddu, M. B. (2003). Mapping the distribution and extent of Quercus suber habitats in Sardinia: a literature review and a proposed methodology. Geographical Paper. no. 171, University of Reading, Reading. Cooke, G. B. (1961). Cork and the cork tree. Pergamon Press, New York.